The huge granite cross, starkly outlined against the blue sky, dominates the entrance to the German War Cemetery in Malame, Crete, scene of some of the most ferocious fighting during the Second World War – the aptly named Battle of Crete. 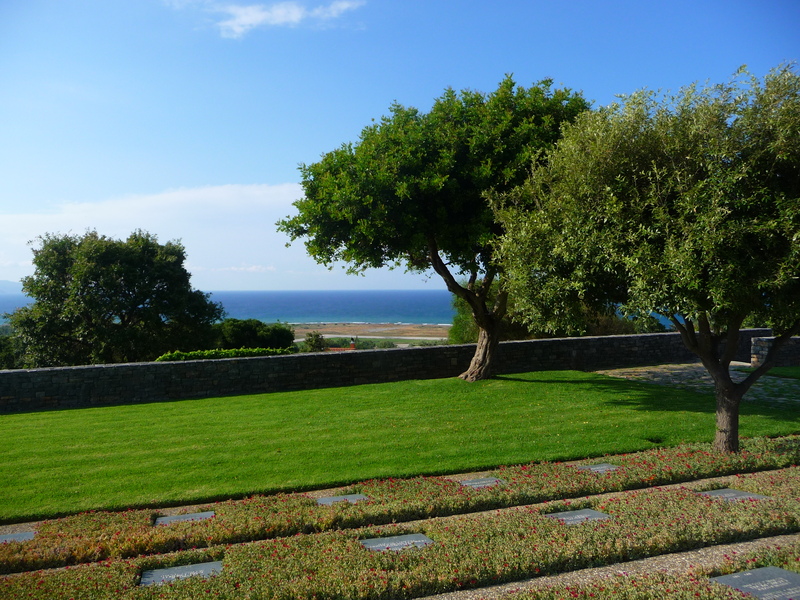 The cemetery, home to the remains of 4,700 German soldiers who died on the island, is easy to find as it is just off the coast road in Malame, a short distance from Chania. Once in the cemetery proper, one is faced with sombre, grey granite crosses dotted about the area with small granite plaques embedded in the ground, each one bearing the name of two soldiers who lie beneath. Interspersed with the grey lozenge-like plaques are tough grasses and plant forms that can withstand the dry heat and the cold, snowy winters of Crete. The Battle of Malame in May 1941 has become famous as one of attack and counter attack, assault and retreat, with the Cretan partisans and what remained of the Greek army on the island, fighting alongside a New Zealand infantry company, the RAF and Fleet Air Arm personnel left stranded at the airfield. Three crosses and two plaques. Over 500 Junkers attacked in a blitzkrieg similar to that launched on Guernica, Spain, five years earlier. Historians still query why the powers-that-be failed to realize that Hitler might try the same tactics again five years later. Wave after wave of German paratroopers invaded the island. The Junkers were followed by an armada of paratroopers who were ferried in on gliders and parachute troop carriers and who darkened the sky as they descended in their thousands. (There were 70 gliders each one holding 10 paratroopers and these were followed by parachute troop carriers). Many were shot as they descended or were enmeshed in the surrounding olive trees. The invaders who died in this assault were initially interred at 62 locations on the island but in 1960, following permission from the Greek Government, the Germans were permitted to recover these bodies which were then transferred to the Gonia monastery at Kolymbari. (The Monastery had been a centre for the Resistance during the Battle of Crete and the monks were imprisoned in Chania prisons, after the Germans found guns inside the chapel). 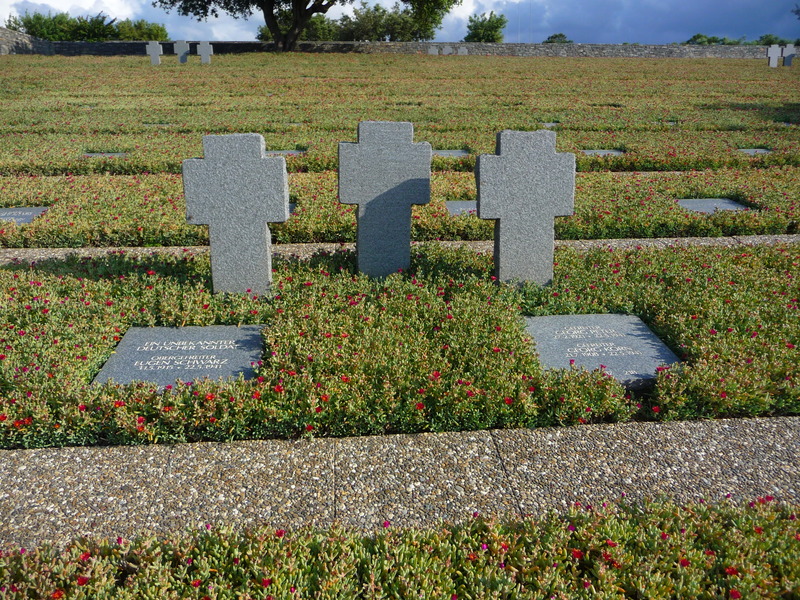 View of the German Cemetery with its crosses and granite plaques. 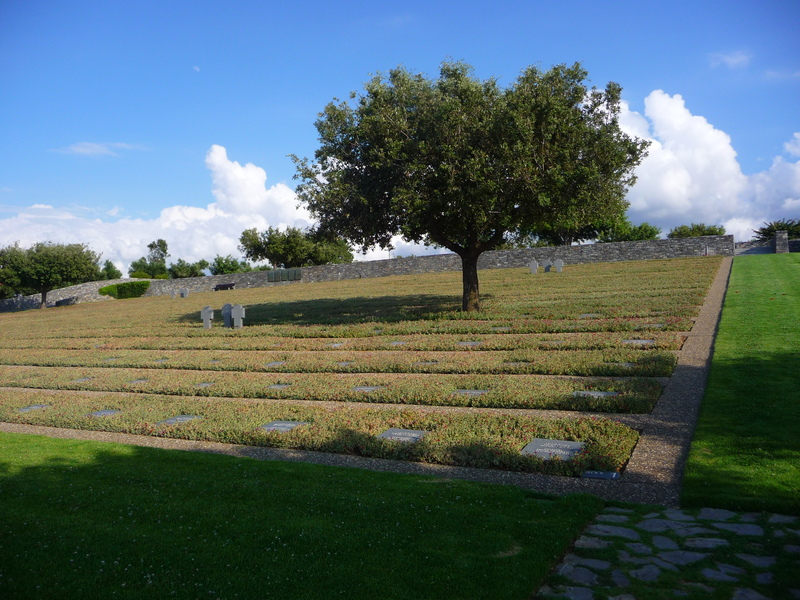 In 1971 the remains of 4,465 German troops were transferred to their current resting place in Malame, designed as a cemetery for the Germans who died on the four main battlegrounds of Malame, Chania, Rethymnon and Heraklion. The cemetery was consecrated on 6th October 1974. The human cost paid by the German and Allied forces in the fight for Crete was very high. There is a little Museum on the cemetery site with information on the walls about the history of the battles but most Cretans dispute the interpretations offered. From the cemetery the view to the coast is stunning. 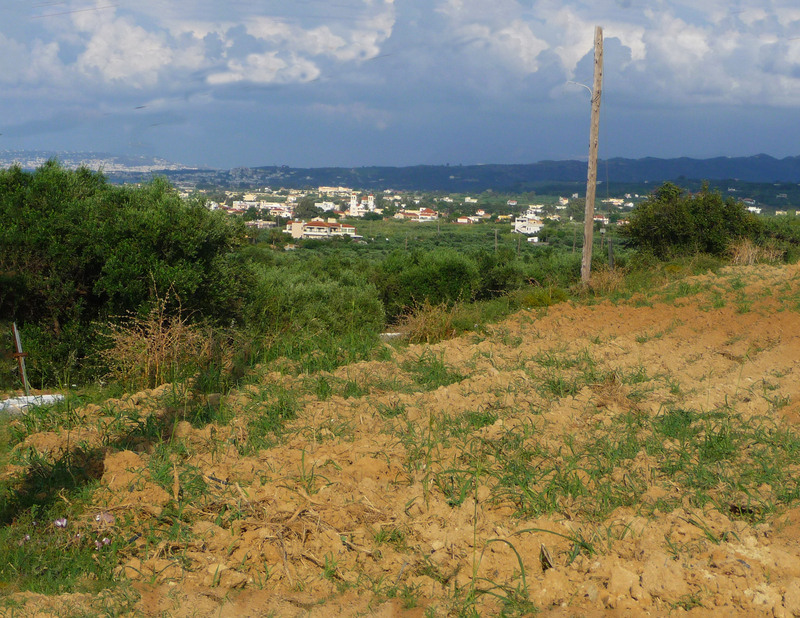 Standing at the top one can see far into the deep blue bay of Chania across hillsides dotted with olive trees, winding down to the Tavronitis River. Goats graze among the trees, their bleating rising from below sounding eerily like a child crying. A thin ribbon of road runs between the olive groves and the Aegean Sea beyond, and it is hard to imagine the horror that erupted in this peaceful area 75 years ago, or to visualize the dead and dying that littered the beaches and fields. Neither side has exact numbers of fallen soldiers. The Cretan Runner by George Psychoundakis (trans. by Patrick Leigh Fermor): John Murray, Paperback (first published 1955). A first-hand account by one of the partisans from the mountains. An informative, interesting piece as one would expect. Thanks, Jan. One never feels that one has done justice to people who found themselves caught up in wars.